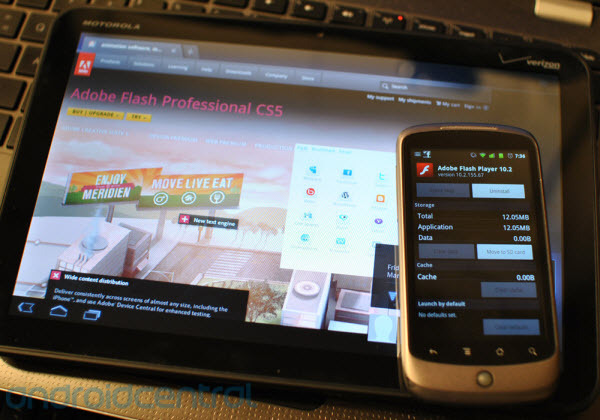 We recently posted that, Adobe Flash Player 10.2 will be available from March 18 for Android FroYo and Gingerbread smartphones as well as Honeycomb tablets with Android 3.0.1 update. But, within a day of its announcement, the Adobe Flash Player 10.2 has been leaked and it is working perfectly on Froyo and Gingerbread smartphones as well as on the Honeycomb tablets. The guys at Android Central have already tried the new Adobe Flash 10.2 on CyanogenMod 7 device (Gingerbread) as well as on the HTC Desire smartphone with Android 2.2 Froyo and it works like a charm. Adobe Flash Player 10.2 comes with smooth playback of high-definition Flash video content on the web, reduced CPU usage, higher frame rates for existing H.264 video content and more.The Adobe Flash 10.2 will be officially available on Android Market from March 18. If you are using the Motorola Xoom tablet, then you should make sure that, the tablet is updated to Android 3.0.1, so that you can easily use the Adobe Flash 10.2 on your tablet device. If you can’t wait till March 18, then you can download the leaked file and install it in your smartphone or tablet. To learn more, head over to this page at MyDroidWorld.